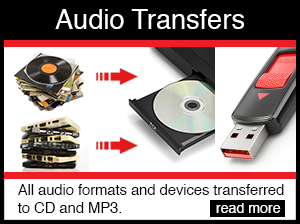 Do you need to transfer from one format to another but don’t have the correct equipment? We can help! Creative Visual Productions a division of Creative Video does all the video conversion work in house at our West Deptford, NJ studio. Your tapes never leave our facility. After ten years video images start to fade off the mylar videotapes. Like photos and film, whose colors fade and grow brittle with age, videotape is hurt by time and chance. Creative Visual Productions digital duplication center located in West Deptford, NJ provides services for residents of the Greater Philadelphia area in addition to a mail-in service to serve customers around the country. Creative Visual Productions duplication services include many new and older formats, so that no matter who you’re trying to reach, you’ve got the delivery system to do so. 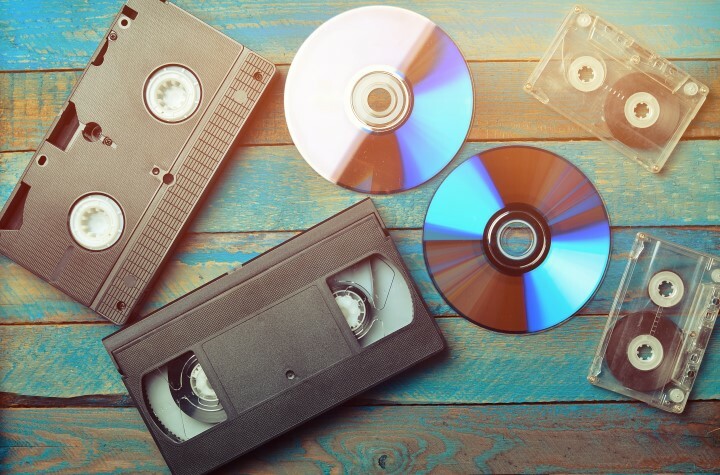 Convert all of those old, bulky VHS tapes into slim, lasting Blu-rays, DVD’s, or digital format. Pricing is determined per source by length and quantity of sources. 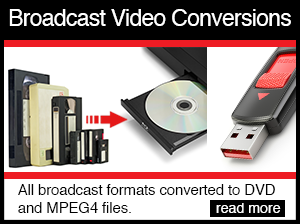 We can take your source and convert it to many formats, including: VHS, SVHS, 3/4, 3/4SP, Betacam SP, Mini DV, DVCam, DVCPro, DV, 8mm, Hi8, Digital Hi8, WMV, WAV, Quicktime, Flash, Realplayer, MPEG-2, Audio Tape, CD, RPM, DVD-5, DVD-R, DVD+R. This process takes your standard definition footage, increases it’s size to fit into a high definition container, crops a section from the top and/or bottom and then smooths the video to account for the increased pixel density. If you have video from Asia, it may be in Secam format. Europe? Might be in PAL format. Either way, we can convert it to the format used in the US (NTSC) and back again. Pricing based on source length. We also provide CD/DVD and Blu-ray Authoring. Whether it’s a small basic screen with a title and a play button, or an elaborate multi-tier motion menu DVD, or a blu-ray disc with precise chapter stops, multiple menus, and bonus features… We can do that!! Click here for more details! You have a DVD. You need two thousand. We can help. 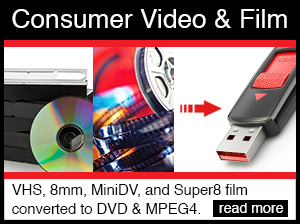 You can provide us with a graphic to be printed on each DVD, or we can create a simple label. Each copy comes with a simple plastic case. Pricing increases with the length of the DVD, but there’s a discount for bulk orders. 2-disc cases, single disc cases with insert capability, and slim transparent cases with colors are the containers we use when we deliver your hard form media. Need something special? We can work with our suppliers to get what you need for your production. Let Creative Visual Productions handle your video transfers today! High temperatures and humidity disrupt the magnetic organization of videotape, the basis for the sound and image data in the tape. They also damage the materials in the videotape itself. The effects worsen over time. Magnetic recording tape consists of a coating of metal oxide particles placed on a plastic backing material by means of a binder, which is typically another kind of plastic. Problems can occur with each of these materials. Malfunction of the tape recorder or player is also a leading cause of tape degradation — and sometimes catastrophic damage, as when the machine “eats” a tape. BUT the big problem is demagnetization. Tape recorders store information, whether sound, pictures or data, by changing the magnetic orientation of the oxide particles to represent sound or light or the ones and zeros of digital data. Over time these organized particles gradually become more random, a process known as demagnetization that is hastened by heat, humidity and oxidation. 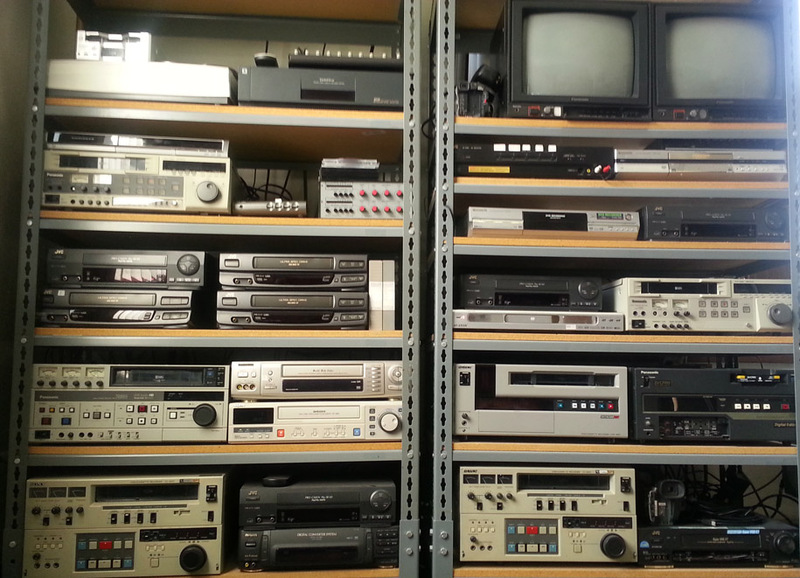 Storing tapes near electromagnetic fields, like those in televisions, computers, refrigerators or electric motors, can cause much more rapid demagnetization. The tape only has to go a bit out of alignment for the playback head to lose the signal from the correct track and pick up interference from the adjoining one. Tracks of a videotape are very narrow, so any imperfection in the tape is relatively large, and the picture gets destroyed. Keep videotapes cool and dry and away from electromagnetic fields. Store tapes in a place with constant temperature and humidity rather than one with varying temperatures. Also keep tapes away from television sets and other appliances that act like tape-damaging magnets. Large swings in temperature and humidity can cause moisture to condense on the tape, possibly hurting both the tape and the VCR. When taking tapes from a cold to a warm place, allow them to reach room temperature over a two hours period before playing them. Rewind and fast-forward tapes to the end, at least once a year. Uneven tension can harm the tape itself. Never leave a tape stopped in the middle. Always remove tape from the VCR when not in use, and store upright in its original container. Malfunctioning machines are the biggest cause of tape catastrophe. Test the machine using a tape that will not be missed. If a tape is damaged, do not reinsert it in the videotape recorder; the tape may damage the machine. Creative Visual Productions can repair broken videotapes that have snapped, twisted, bow-tied or come off the spool. 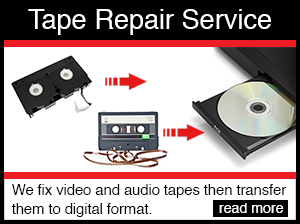 The average cost to repair an individual tape is $25 to $50.